I promised you guys a recap of my time at C2E2 – The Chicago Comics and Entertainment Expo. It’s really long, so bring a sandwich. After scrambling to get out of town Thursday morning, I pulled into Chicago around 3:30 in the afternoon. I was a little bit stressed because load-in time at the convention center closed at 4:30 and my Google Map instructions were crap! The driving directions the show promoters gave me didn’t help much, either. I literally spent 45 minutes driving around and around the convention center, unable to find the loading dock. It turns out, I had to go UP some crazy ramp. The docks weren’t at street level! That was a first for me! Joel was a really cool guy and we had great conversations throughout the weekend. He is very serious about his career as a cartoonist and on top of his game. I learned a lot from him over the course of the next few days. After meeting up and making introductions with a few people from Topatoco, including David Malki from Wondermark, we decided to check in to the hotel. Later, we had dinner before I dragged Joel to Millennium Park to visit the sculpture “Cloud Gate”. We had a hilarious interaction with some high school kid that was trying to give us grief. As we approached the sculpture, this kid – part of some kind of tour group – yells to us, “Hey, guyyys! How do you like Seattle?” We both looked at him like an idiot and just kept walking. The kid immediately folded up, shuffled his feet like a 5 year-old and with his head down muttered “I don’t know. I was just kiddin’ around…” It was awesome. Later in the evening, we met up with the crew from Topatoco and this time Jeffery Rowland from Wigu, Jeph Jacques from Questionable Content and Matt, Rob and Chris from Cyanide and Happiness came along for the ride. We spent the rest of Thursday evening bar-hopping through downtown Chicago. We’d go to one bar that closed at 11:00 before being directed to another bar that closed at 1:00, before being directed to ANOTHER bar that closed at 2:00. I had a blast. Okay, okay. I get you. Well, let me say this: The first sale I made was just after the doors opened. I sold a copy of Theater Hopper: Year Three to Steve Sansweet. Now if you don’t know who Steve Sansweet is, that’s alright. But as it turns out, he is the Director of Content Management and Head of Fan Relations at Lucasfilm! I totally didn’t recognize him because he was wearing a beard and, frankly, because I wasn’t on the lookout for anyone from Lucasfilm while I was there. But I talked to him for a little while and he said he decided to pick up my book after seeing one of my comics with George Lucas in my sampler booklet. I just hope it wasn’t this one. So there you have it! Theater Hopper: Year Three is approved by Lucasfilm! I wish I had been smart enough to ask Mr. Sansweet for his picture while he was at my booth, but I was so gobsmacked by the exchange, I didn’t think of it until 2 hours later. If someone knows how I can get in touch with the guy, please let me know! I’d love to get a shot of him holding up the book for the site! Needless to say, it was a GREAT way to start the convention. I don’t know if my contemporaries felt quite as optimistic after Friday, though. A lot of people commented that they thought traffic was a little too light for a Friday and worried what kind of impact that would have for their show. Personally, I talked to a bunch of people. Although, I will admit, I didn’t make a lot of sales. I chalked it up to the convention simply being so VAST that attendees were just trying to get the lay of the land and figure out what the show had to offer. Everyone I made a sale to that day was wearing a “Friday Only” badge. So I was still holding on to hope. Friday evening, I attended the Webcomics Town Hall Panel. Since Joel was sitting on stage with David Malki from Wondermark Ryan Sohmer and Lar deSouza from Least I Could Do, Erika Moen from DAR, Lucy Knisley from Stop Paying Attention and Danielle Corsetto from Girls With Slingshots. There were also two guys with Zuda comics, but for the life of me I can’t remember them. Sorry. Actually, I was kind of tuned-out for most of panel. Largely because the moderator (who I also don’t recall) was as boring as a bowl of oatmeal. He talked at length about his own webcomic credentials and then introduced each individual artist by reading lengthy bio information from a Powerpoint presentation that was being displayed on a screen behind him. He would have been better off just asking the panelists to introduce themselves and gotten on with the Q&A. David Malki basically took the whole thing over, even calling on members of the audience who had questions. He practically muscled the moderator out completely. Kind of rude. But at the same time, completely necessary to keep the panel from becoming a total snore-fest. There was also some minor controversy when apparently Malki called out Ryan Sohmer on some practice or another. Again, I wasn’t paying close attention. Someone from the audience also asked a question that took a shot at the Zuda guys, which most people on the panel thought was off sides. Truthfully, there wasn’t much for me to learn from listening the panel. I was just there to support the scene. I attended the panel with my good buddy Gordon McAlpin from Multiplex. After it was over, we kind of tried to sneak in next to the group of webcomic artists also in attendance to see what their plans were for dinner. I was overjoyed when, after saying “hello” to Danielle Corsetto, she immediately recognized me and gave me a hug! I wasn’t sure she’d remember me, but we were on the Business of Webcomics panel together at Emerald City Comic Con last year. She is OFFICIALLY the sweetest person in webcomics! Eventually, 15 of decided to get dinner together at Giordanos for pizza, but didn’t know that it is a world-renown restaurant. The wait was something like 2 hours. So we ended up going across the street to Jake Melnick’s Corner Tap for some hot wings. There were more webcomic people there than you could shake a stick at! I met Phil Khan, Erica Henderson and T. Campbell from Guilded Age David Willis from Shortpacked! and Randy Milholland from Something Positive. A bunch of other webcomics guys also wandered in off the street just by accident. I think Zach Weiner from Saturday Morning Breakfast Cereal and Alina Pete from Weregeek were there, too (among many others – the Cyanide and Happiness guys showed up, too), but I didn’t get to say “hi.” There were so many of us, they had to split us up into different tables! We were half the restaurant at one point! What was craziest about all of this interaction with different webcomic people was how many of them were already familiar with Theater Hopper. My social circle among webcomic artists is pretty small and, like most artists with social anxiety, it’s sometimes difficult for me to go up to a stranger and strike up a conversation. But this time, I made an effort to change things and I made sure to be friendly and up front. When I walked up to Randy Milholland and said, “Hi, my name’s Tom Brazelton,” he responded “Oh, yeah! From Theater Hopper!” and that was crazy validating. By the way, if you ever end up at Jake Melnick’s Corner Tap, get their Poncho Wings. A local recommended me to them and they were excellent. Garlic and cayenne pepper! Oh, yeah! After dinner, pretty much everyone agreed to call it a night. Which was probably for the best. The next day at the convention was noticeably busier and again I talked to a bunch of really cool fans. One guy came up to the booth wearing my “Junkie” t-shirt. A little later, a different guy came up wearing my Sean Bean shirt. Seeing fans wearing my shirts always brings a smile to my face. Later in the day, a girl that I had given a sampler book to came back to let me know that she was laughing out loud while reading it. She brought her friend to my booth to show her what the fuss was about. That’s pretty awesome. On Saturday, I was asked to pinch hit at the Reading With Pictures Iron Artist Tournament. Basically, they put me on stage with a couple of other artists and we were given a bizarre theme and asked to draw the first thing that came to our minds. The first theme was “Superheros When They Were Young.” So, of course, I drew Iron Man as a baby. The second theme was Escape from New York meets The Princess Bride. So I drew Snake Plissken as Inigo Montoya. I got lucky on that second drawing because someone asked me to draw them as Inigo Montoya earlier in the day! Gordon McAlpin was also part of the tournament and I have to say that his Baby Blue Beetle was adorable. I don’t know how much it was auctioned off for, but I bet it fetched a pretty penny. I had a great time on stage drawing and helping contribute to a worthwhile cause. If you want to see pictures of the event, a bunch of them have been uploaded to Flickr here. After we wrapped things up at the tournament, Joe Dunn and Phil Chan from Another Videogame Comic came with us to met up with the guys from Guilded Age and Cyanide and Happiness at the World’s Worst Pizza restaurant. It was so bad, I don’t even remember the name. All I remember is that someone ordered a deep dish BBQ pizza and was repulsed by it. That pizza was only mentioned in hushed tones after that. From there, the 10 of us met up with yet ANOTHER group of webcomic artists across town at a karaoke bar called Brando’s at an event organized by Abby L, who draws The Green Avenger and The Rose Deli Project. It almost didn’t happen. The bar was very small and there was already a large, obnoxious bachelorette party taking up most of the seats. The club owner saw we were about to leave and offered us one free round of drinks just as soon as the bachelorette party left – which turned out to be about 10 minutes after we arrived. Unable to refuse free drinks, we all spilled in to the club. I’ve only done karaoke once in my life. Drunkenly, I tried to sing AC/DC’s “You Shook Me.” I tried to do the Brian Johnson voice and everything. It was terrible. However, I like to sing in the car and I think I have a pretty good voice. The only problem is, I don’t know the lyrics to a lot of songs that aren’t 90’s hip-hop. After a few rounds, I started to entertain the idea that I would sing “The Humpty Dance” by Digital Underground. Those of you familiar with Mitch Clem’s work might recognize my affinity for the song and how thoroughly it annoys others. Joe Dunn tried to talk me out of performing the song, but when I mentioned it to Spike from Templar, AZ, she insisted I do it and promised to back me up. When my time came to grab the mic, not only did Spike join me on stage, but her husband Mike Sheridan and Joel from HiJinks Ensue joined me on stage as well. I’m proud to report that we killed it. Or, at least I think we did. In my estimation, everyone who steps on stage to perform karaoke has to convince themselves they’re killing it or they would fold under the weight of their own embarrassment. Two LEGITIMATELY awesome performances can be attributed to Joel’s rendition of Styx’s “Mr. Roboto.” Also, Dave Reiley from Dead Winter did a thundering version of Metallica’s “Fuel.” Needless to say, a fun time was had by all. After karaoke, Spike was nice enough to invite everyone back to her apartment for an after party. I’m always amazed how quickly webcomic people – who are otherwise strangers – can fall into passionate, well-informed conversations so easily. Before I knew it, we were there for two hours. I could have kept talking with these people for another six. The last day of the convention was mild compared to the previous two. I did better with sales than I did on Friday, but not as well as I did on Saturday. One exchange I had, however, was “100% WIN” (as the L33T kids say). Near the end of the show, one of the event volunteers approached me and asked for a custom sketch. What was sweet about it was that he didn’t want a sketch of himself, but one of his wife. He identified himself as a fan of Theater Hopper, but it was his wife that introduced him to the comic. She had been on board since the early days and “shared my hatred for Ben Affleck,” he said. 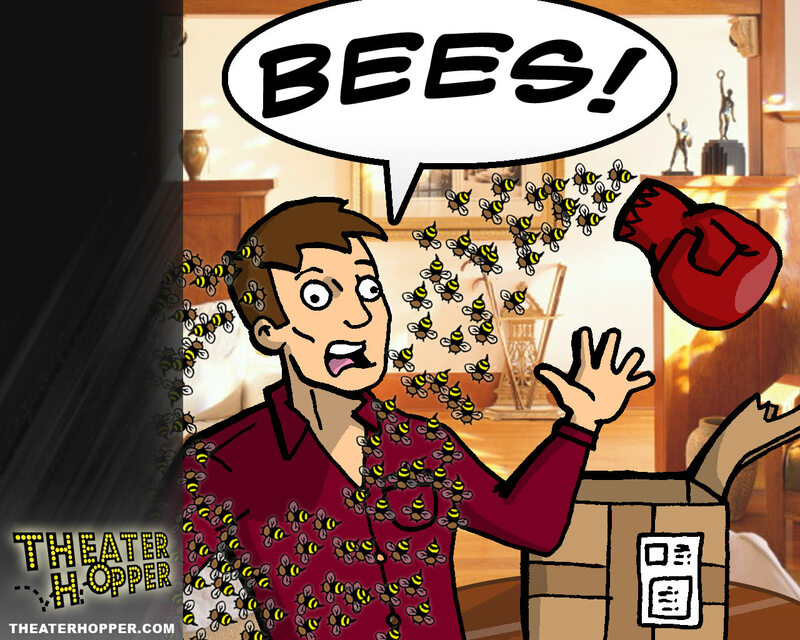 He asked that I reproduce the last panel of this comic where Ben Affleck opens a package from Jared filled with bees featuring her instead of Affleck. According to this guy, his wife has been using that image as her desktop background for the last 4 years. I didn’t have to wait that long. Five minutes before the show was over, the man’s wife approached my table. I misunderstood the situation thinking that the husband was volunteering and the wife was somewhere else. But it turns out she was volunteering as well, just in a different area of the show! She wasn’t able to leave her post. She was so effusive and thankful for the sketch, it was utterly heart warming. Both her and her husband were so friendly and appreciative, it was really the best way to end the convention. I left on such a high note. For her, I decided to produce a 1280 x 1024 desktop wallpaper from the last panel of that comic. I just couldn’t let her continue about her work without something that was a little better in quality. I talked to a lot of people about the success (or lack thereof) of C2E2. A lot of my contemporaries didn’t do as well with sales as they had hoped. Some people I talked to said they didn’t think they were coming back next year. While I would have liked to have sold a little more than I did, I can’t look at the weekend as anything less than a complete success for me. I got to talk to talk to a myriad of different webcomic creators for the first time. I shook hands with fans who were so supportive and thankful. Fans who told me they think my comics are getting better and how much they enjoy reading the movie reviews. One guy told me mine were the one reviews he trusted. I mean, how can you NOT feel great after a weekend like that? I had a blast and I hope I can go back next year.